Pianist Maurizio Pollini performs piano sonata No. 30 in E Major, Op. 109, Piano Sonata No. 31 in A flat major, Op. 110 and Piano Sonata No. 32 in C minor, Op. 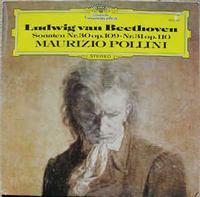 111 by Ludwig van Beethoven for this audiophile recording.